Gloria gives Doreen a plausible excuse for having a gun. The women decide to take a united but passive stand against Joan and Judy finds Donna having a fix. 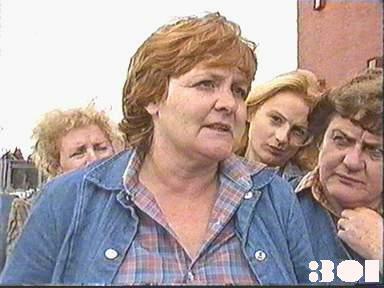 Extras at the prisoner meeting: Lil, Babs and "Mary" and Angie Dobbs and ??? Doreen ignores Gloria's order to keep quiet about the gun and tells Judy, who demands that Gloria hands it over or leaves. Gloria has no option but to give up her gun. The women discuss how to fix Joan: Hannah suggest that if they all ignore her orders the Department will have to remove her. Steve refuses to support Meg's idea that Hannah should be transferred to Barnhurst, because it would look like rewarding her for being difficult. No-one responds to Joan's wake up call, but the women meekly follow Colleen's orders. The same thing happens again at breakfast when Joan orders them to move out. Chrissie tells Joan what is going on and offers to make a deal if she returns the betting money she took from Doreen, but Joan declines the offer, saying she prefers to deal with Bea direct. Joan overhears the other officers in the staff room discussing her "precarious" position. When Meg visits the halfway house, Doreen tells her that Joan took her money. Joan requests Union support from Meg, so Meg asks her if what Doreen's story about the betting money is true. Joan denies it, and Meg agrees to put her case to the members, while letting Joan know that as far as she's concerned, she ought to kicked out of the job right away. Judy goes to confront Donna about Susie's sudden high spirits, and finds her shooting up. She takes the syringe off Donna and slaps her face. Bea writes Chrissie off when she obeys Joan's order to talk to her outside the laundry, but Chrissie makes a deal with Joan: she demands, and gets, the betting money back. She hands the money over to Bea and tells her she had no intention of keeping her side of the bargain by calling off the boycott: after all, it's Bea who's top dog, and the women follow her not Chrissie. Chrissie gives the money to Bea, who announces that the boycott is still on. Joan's claim for Union backing is discussed: only Meg votes against supporting her. Joan finds she is overoptimistic in hoping that handing the money over has solved her problem. Doreen starts work at the shoe factory. George Logan tells Barbara they have lost a large contract: her suggestion of selling off surplus stock he's already claimed as a tax loss gives him the idea for a shady deal. Colleen warns the women of the consequences of an officers' strike if they persist with the boycott. Joan tries to drag Hannah out of the rec room to talk to her, but the other women stand in her way. Barbara offers to get investment advice for Doreen from her boyfriend Phillip. Erica asks Bea to back down, but Bea merely repeats her allegations against Joan. Doreen sees the shoes being loaded onto a van and overhears part of the conversation between George Logan and his business associate. Mr Logan tells Barbara to put the $10,000 in cash in the safe and orders her to fire Doreen when he finds out she is an ex-prisoner. The women hold a meeting during exercise period: Erica asks Joan to get the women inside, but they refuse to move .